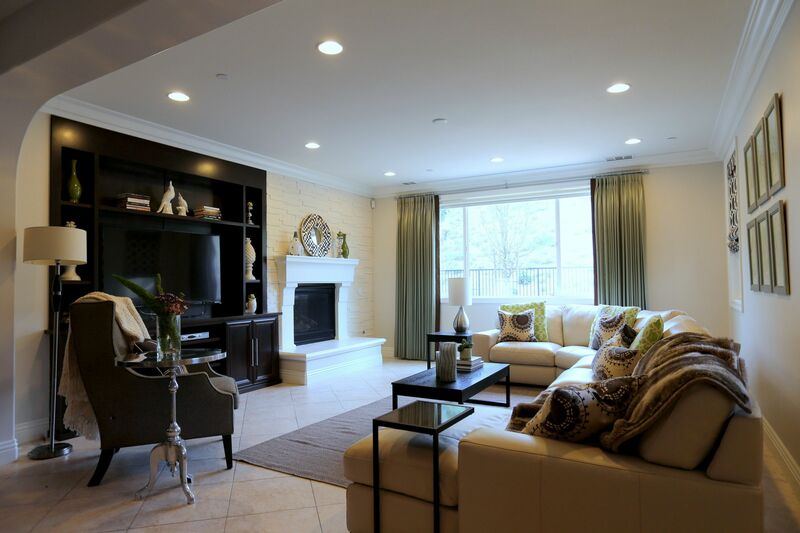 This family of 4 in Chino Hills, CA needed some help livening up their family room and bonus room. The family spends a lot of time together watching TV, movies and playing video games. I helped warm up their living room with a large leather sectional, new custom Roman shades and decorating with accessories. Adding a custom built entertainment center and installing stacked stone around the existing fireplace, helped create one large focal point wall. New paint also neutralized the room and helped pull everything together. They have 2 young sons who needed a space to hang out, chill and do their homework. They had a bonus room/loft area on their second level that wasn’t really being used. I split the long space in half. One half for TV and gaming, the other half as a homework station with storage. We used some existing furniture they already had in combination with some new store bought pieces, a custom blue velvet tufted ottoman, custom drapes and accessories to brighten it up for the boys.